Terletak di tengah-tengah Cape Town, hotel butik yang telah memenangi anugerah ini terletak di Dataran Warisan yang elegan. Ia mempunyai kolam renang spa di atas bumbung dan bilik-bilik yang bergaya yang dihias dengan menggabungkan unsur-unsur Eropah dan Afrika. Setiap bilik di Cape Heritage Hotel mempunyai ciri-ciri dan suasananya yang tersendiri. Ianya dilengkapi dengan katil-katil yang lebih panjang dan menu bantal. Beberapa bilik mempunyai siling kayu jati atau ruang tamu yang luas, yang lain pula mempunyai bilik mandi mewah. Membuka keluar ke Dataran Warisan yang bersejarah, hotel ini menyediakan peluang menjamu selera di beberapa restoran yang terbaik di bandar. Sarapan pagi disediakan di hotel dan menawarkan pastri yang inventif dan smoothie yang organik. Cape Heritage menawarkan akses mudah ke jalan raya yang meriah dan kawasan perniagaan di bandar ini. Tarikan-tarikan yang berdekatan termasuk Signal Hill, Company Gardens dan V & A Waterfront yang terkenal, semuanya boleh dikunjungi dalam masa 10 minit berjalan kaki. Breakfast was very good and staffs so friendly and helpful. Amazing staff, great breakfast, lovely rooms, totally recommend it! The hotel is very nicely located. Building has lot of history and the room was very beautiful with elegant bath tub. The staff is super nice and helpful, they really made me feel welcomed. Breakfast was good and you can order dishes from the menu. I don't have any bad word, I would definitely go again! The staff is very friendly and helpful. When we had an issue with our room they immediately moved us to a new room. The breakfast is really good and very filling, no need for lunch. We stayed 3 nights in this delightful hotel which is a mix of heritage and modern art - wonderful combination! The staff were outstanding and very friendly and helpful. Great breakfast served in yard or old dining room. The rooms are all different and we recommend the old style - like us!! Prices are rather high but the service is good. Only issue was on a weekend the city is very quiet and shops shut on Sunday's downtown. We took the open top bus around Cape Town and that was wonderful and used the time well. We would recommend the hotel! Beautiful rooms (cool old restoration), delicious breakfast included, modern bathrooms and good AC. Most importantly, really helpful and accommodating staff. They arranged tours for us and were so good with information and knowledge. Good location, great breakfast, extremely helpful staff. Restaurants nearby as well as shopping. Very attentive staff, very unique rooms in an authentic heritage building. I had a great stay at Cape. The hotel building is old but managed very well, which gives good ambiance. Room interior is fun and unique. It is located strategically in the centre of City Bowl. The room, is however, a bit noisy because of its proximity with bars and restaurants. And there's no room service. But the staffs are very attentive and helpful; a service that makes it worthwhile to stay there. Very accommodating as we arrived very early and the room was available. Very comfortable, large room and bathroom. Disco noise on Saturday night spoilt the tranquillity of the room. There was a partial view of Table Mountain from the room. Parking was convenient and included in the room rate. All staff were most welcoming, friendly and helpful which is just what you want! Friendly staff. Restaurants/plaza right outside hotel door. Close proximity to parking lot. This was our second time, in six years, at Cape Heritage. Each time, the staff was wonderful. Was very appreciative of the support rendered when we need to change our travel plans due to the weather and arrive a day before than actually booked. The staff helped to ensure that our stay was hassle free with the one day extension made effortlessly! The room 105 is another very nicely designed room with toilet that comes with a bathtub and shower and 2 sinks. The only thing about this room is that it is above the pantry and noises transmit upwards easily, not for light sleepers. 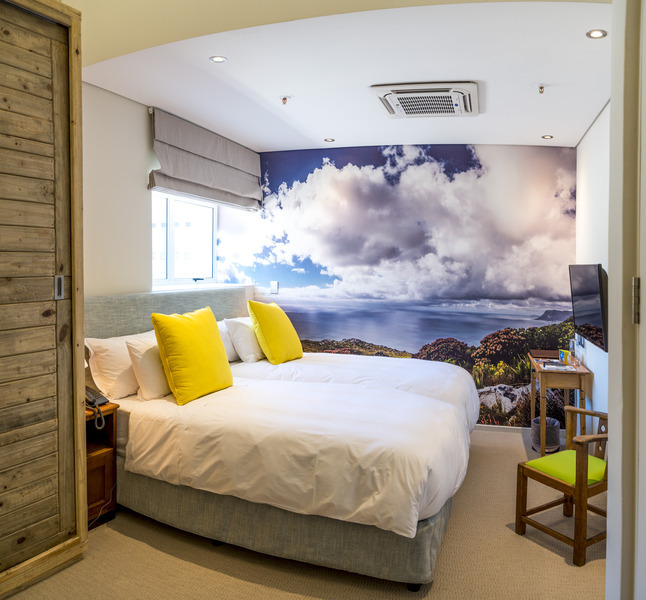 We have the most wonderful stay in Cape Heritage with the friendliest of staff and absolutely uniquely designed comfortable rooms. Rooms are pretty clean except for a small cockroach that I easily got rid of. Loved the new quirky design on a historical building. The V&A is just 50rand taxi ride away. This hotel was featured on TA and earns its high ratings. We've stayed at many hotels in our time and for the value, location and service, you cannot beat what this hotel offers. The breakfast is filling each morning has a made-to-order and specials daily but is complete with full spread of cheese, meats, yogurt, cereals, fruits etc. Our 20 mo-old daughter who has a strict diet was able to eat plenty. Our room, #107, is probably the best room. Corner room with windows, sitting area, bathroom with separate shower and tub (meticulously cleaned) was beautiful in style and functionality. The hotel is located in a square offering a variety of food: Thai, burgers, steak, and French so it is convenient and reasonable enough. With a daughter who eats at 5:00PM daily, it was perfect for us as it did not draw a lot of crowd and had a wide range of availability to not be boring. A laundry service store, car rental and beauty salon were within the block. As mentioned before, very convenient for first time travelers. Last but not least, the staff were gracious, helpful, and also available as there is a 24 hour desk service. EXCELLENT place and definitely a must for travelers, young or old, with children or childless, truly one of our best experiences. Enjoyed this hotel as there are many options for restaurants within the square and within walking distance of galleries and antique places. The old rooms are really charming. Very nice small hotel with wonderful rooms and local, tasteful art on the walls and in the rooms. this was a very comfortable place to stay. the breakfast was just right every morning, with the staff catering to your taste in food and coffee. the rooms were spacious and the bathrooms were large and wonderful. the limited internet was the only down side. i prefer to use my own computor in my room, but could not. complaints set the staff scurring to accomendate but they were only sucessful, on occassion, in getting me access in the hotel living room. the rest of the time i had to use the hotel computor. 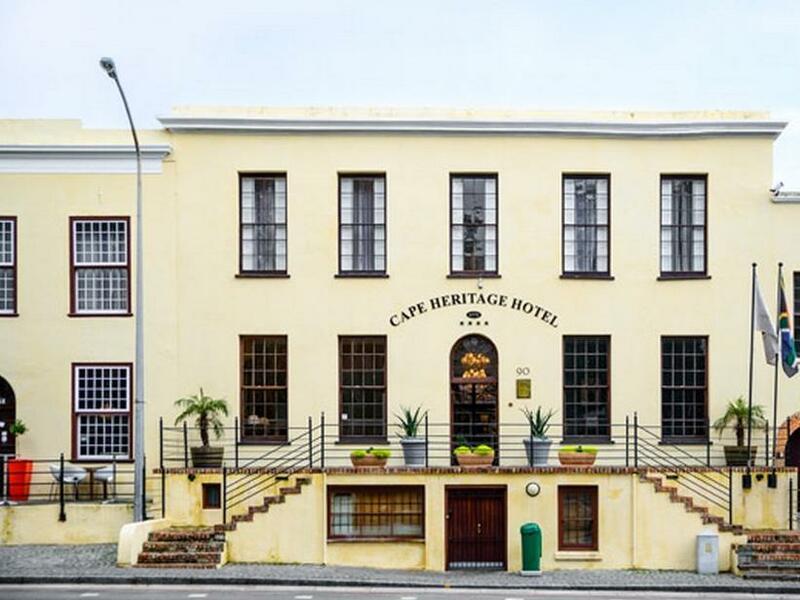 the cape heritage is centred around an historic courtyard, overhung with vines. the ambience for breakfast or afternoon tea is wonderful, and three restaurants also open onto the same small courtyard. the hotel staff are very accommodating and can arrange anything from a short tour, to a taxi to the airport. our room was very comfortable and done to a very high standard. from what we could see of the other rooms, each was uniquely decorated in an artistic way that suited the historic character of the building. no minuses for this experience, and my wife and i would gladly return on another trip.